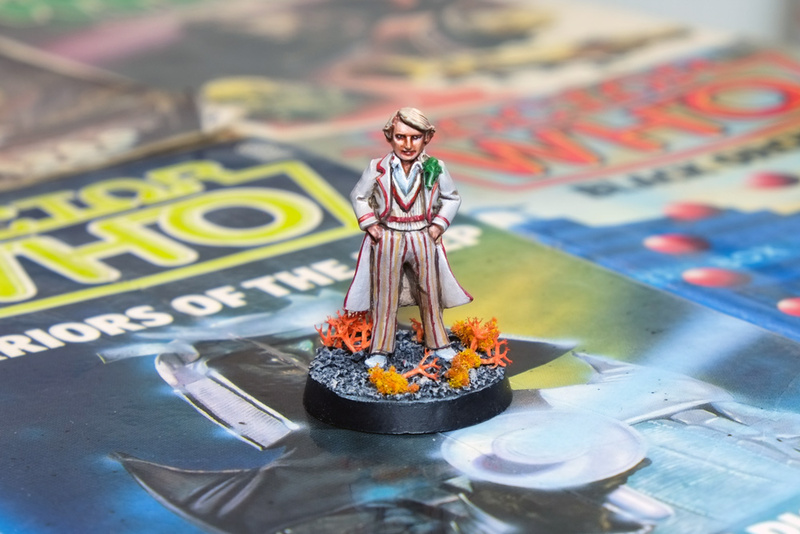 The miniature was originally produced in or after 1996 by Harlequin Miniatures, and that company regenerated into Icon Miniatures and then regenerated again into Black Tree Design. I remember buying some in the mid-1990s when the Invasion Earth game was being haphazardly stocked by the geek shop in the centre of Manchester – the Coliseum. I’d like to collect the 1980s Games Workshop range of Doctor Who figures too, but the Harlequin ones are much more readily available and have a much bigger range of monsters and aliens to pit the Doctor against. 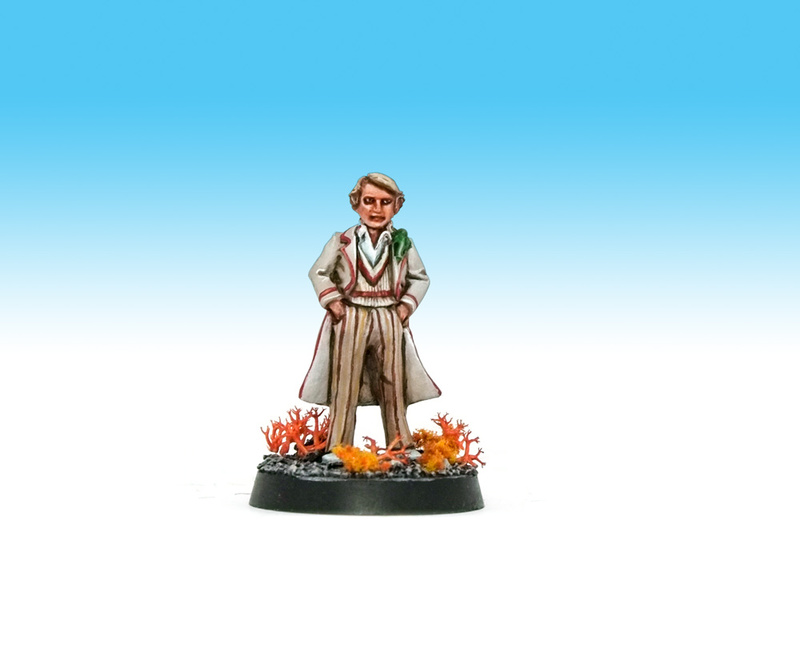 I really enjoyed painting his stripey trousers and cricket whites. There’s another version of the figure actually holding the bat which I’ll treat myself to at a future point when (if) I’ve found some other cricketeer figures. It would be the first time since being eleven-year-old nerd I would feel comfortable playing wargames on my Subbuteo Cricket pitch. 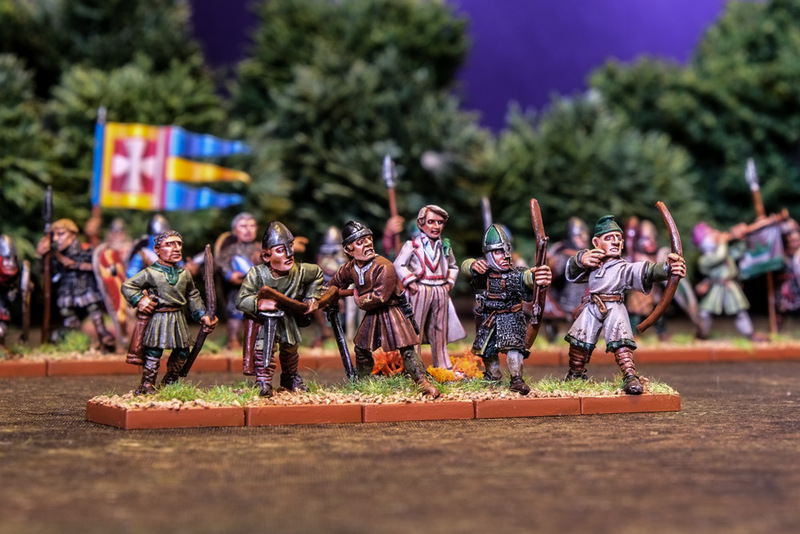 The Doctor supervising some peasant archers in 1066. Games Workshop’s early Imperial Army figures are suitably generic to stand in for future soldiers. I can use these Warhammer 40K figures as the Guild of Adjudicators from the 28th century as seen in Cold Fusion. In the grim darkness of the far future, there is only Warhammers. The Doctor supervising the peacekeeping force in 2766. So, what next? The Doctor Who universe has all sorts of weird and exotic aliens. I’m going to focus on the Fifth Doctor’s adversaries and companions next so I can play out my favourite episodes in the medium of wargames. Love that last army shot Chris. A fantastic collection of oldschool RT on display. Do you get them out much? Last time was actually in that Shadow Wars campaign pre-BOYL with you. 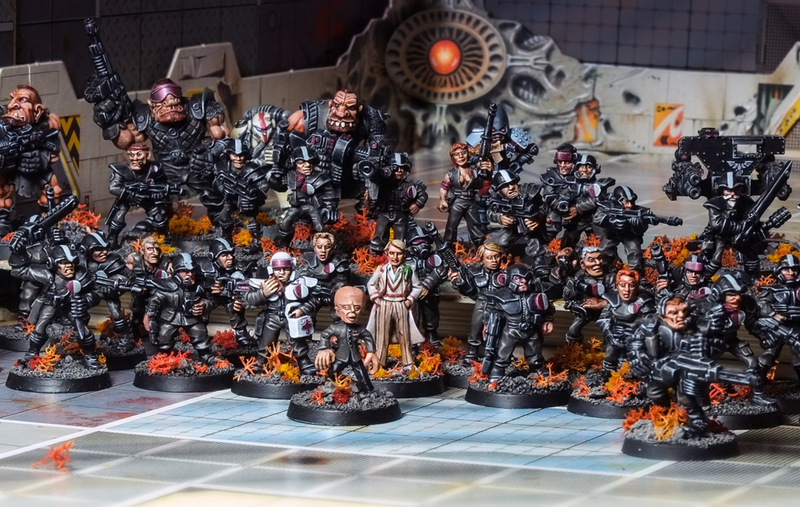 Beyond that the Godbreak 84th are at an awkward size where they’re not equipped with enough vehicles and firepower to take to modern 40K tables. I need to work on some Imperial Sentinels and tanks to get them to that point. The Harlequin/Black Tree figures are fantastic… ok sometimes they look pretty off but you can’t beat the staggering number of characters they made. I’ve painted this Doctor myself and yes, he’s a really nice figure. Not perfect but they captured the likeness and overall impression quite well! Your paint job is excellent: clean and detailed, and the colours are bang-on. Thank! It’s a bit of a back-handed compliment, but I think that the quality of the miniatures reflects the quality of the costumes and effects in the show – both are donw much better these days, but for their time they were grand. Crisp and clean, natty even, as to be expected from Ninjabread. Does the character wear celery regularly? Say what you like about the Doctor, but genre incompatible he is not.